Ruban d'Orange is the latest fragrance from the L'Occitane en Provence chain, which is becoming very nearly as ubiquitous as Starbucks. 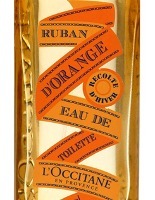 Ruban d'Orange is being advertised with the tag line "bring sunshine to winter", and has notes of Calabrian lemon, mandarin and sweet orange of Sicily, bitter orange of Seville, green fig, vetiver, tonka bean and cedar. I am a citrus-lover, and have found two holy grail fragrances in this category already: Carthusia Mediterraneo for lemon, Parfums de Nicolaï Balle de Match for grapefruit. Lime and orange are still up for grabs, and orange seems particulary hard to do right, or at least to do right in a way that keeps your attention for more than 15 minutes. Ruban d'Orange isn't going to take the top spot for orange, but it is a nice scent for the price and worth trying. It isn't really a straight-up orange — there is lots of fig and cedar, and it calls to mind a simpler, less cedar-heavy Hermès Un Jardin en Méditerranée. It isn't quite so candied as the L'Occitane Verbena, nor is it quite so short-lived. Still, it isn't a power house and you're going to need touch-ups. I love the cheerful packaging, and will be thrilled if L'Occitane releases the fragrance in a travel size. I have a very hard time buying 100 ml of anything these days. Unfortunately I didn't get to try the body products, but I'm very interested in the scrub and the skin milk. Please comment if you've tried them! Ruban d'Orange is available in Eau de Toilette ($40 for 100 ml), shower gel with pulp concentrate, skin milk, soap, lip gloss and body scrub. A "discovery set" including travel sizes of the bath & body items is $28. It is interesting what you said about orange, I love orange, but this fruit defies the alchemists' quest of bottling. There is always something “off” with most of the orange-y fragrance that I've tried, unless it came from the rind of the real thing, the orange smell becomes stale and plastic after 10 minutes. I was sitting in one of those Moor-influenced cloisters in Spain one early afternoon. A woman was sitting a few steps away, peeling and eating an orange. The day was drenched with sun. The sharp, pungent, unmistakable scent of orange wafted over and I thought, that's how an orange should always smell like, the perfect, unadulterated, dare one say, “true” scent of orange that conveys the color, the tart, the sweet, along with the smell. I don't want my person to smell that way, but oh, if someone can bottle that smell to transport my limbic brain back to that instant, I would pay a lot for it. I finally tried Bele de Match…oh, I completely understand why you like it so! It's amazing. What a great description, thanks for sharing. Not sure anyone has ever captured *any* citrus to that extent, but they've certainly come closer with lemons — there are actually lots of great lemon scents. Only a few great grapefruits, possibly one or two good limes. To my mind, nobody has done a really orange-worthy orange. This summer's L'Artisan was a big disappointment, I was really hoping it would be “it”. It is a lovely scent, and one of few grapefruits that doesn't go sour on me. I know Guerlain Pamplelune works well on some, but on me it is truly ghastly. They didn't have that or the scrub when I was in. They did have the body milk, but like an idiot I neglected to try it. Hah hah hah! Just the cold facts, eh? LOL I am almost positive it smells – and tastes – like orange sorbet, but I'm going to double-check tonight just to make sure, LOL! Have you tried Malle's Cologne Bigarade? Its a Jean Claude Ellena creation and one of my favorites. It smells like fresh crisp orange and as it dries down there is some saffron and musk on me. It is, by far, my favorite orange scent. Great suggestion, and I know lots of people adore it. Unfortunately, it smells like heaven for about 5 seconds on me, then it turns into something absolutely horrible which I can only describe as rotting orange flesh. I like to smell it in the tube at the Barneys FM boutique though! You know, L'Occitane sells nice products. I never truly realized this until I visited their store last month with some perfume friends. I purchased the incensey L' Aprairie (I think that's the spelling). I gave it to my husband, and he smells just wonderful in it. Their men's fragrances are very nice, too. Like Starbucks, I tend to ignore it, but I gotta tell you: The next time I am at the mall, I just may give L'Occitane another visit. They are everywhere, but many of their things smell very nice. There's one of the men's scents I really like too, and the 4 Roses (or whatever it's called) smells amazing on a friend of mine. I've been pleased with various skincare items. So … L'Artisan FdeO didn't do it for you? I think it's the closest for me, although I love the Serge Lutens (I think you loathe the cumin in it), but my favorite in the winter is my silly little Arancia Dolce. Oh, I agree entirely, they do a nice job. Many of the fragrances are too sweet for me, but not all of them, and I really like the body products. Did I ever tell you that I used to work for L'Occitane? I am glad to say that I still liked the company AND their products very much after my stint with them was over! =) This sounds very pretty! But I most wanted to wish you the warmest birthday wishes!!!!! I hope it is a lovely, day and you have the best birthday weekend yet! The L'Artisan FdO is great for orange blossom, but not the fruit, exactly, although I think it does have some citrus as well. And you're right about the SL! R, I didn't know it's today, aw – Happy birthday! I hope you get lots of scented delights! And please, decay? Don't be silly, LOL! If you told me, M, I forgot, but it must have been a fun place for a fragrance fan to work. There are so many great citrus scents though, and so many great lemons. There must be a great orange *juice* out there waiting to be created. I am hopeful! R, slightly off-topic, but I had to tell you after all my griping about SAs… I stopped at L'Occitane once to buy my last gift on the way to a friend's birthday party (I had the other two items, a shirt and a purse, with me). The SA asked if I wanted my purchase wrapped, found out I was on the way to the party and she insisted on wrapping the other items as well! And she did it beautifully, in their layered paper with ribbon. Now THAT'S service!!! Needless to say, that's the only one I shop at, although there are several nearby now. R, have you tried Acqua di Parma Blu Mediterraneo Arancia for an orange scent? I've only sniffed on blotter cards, never on my skin, but it always smelled very very orangey. I ill have to go smell todays scent theres a L'Occitane right down the street from me. Many people love that one. I really like the first few minutes, but found it too sheer & short lived — and was thinking so much more expensive than the L'Occitane, but now that I look at the price per oz, it isn't. Maybe I need to give it another try. That really is good service, LOL…maybe I'll try stopping by with my unwrapped gifts! Arancia di Capri I love, and it is fairly long lasting in my skin (though the notes that remain are of clove or something like it). My BF has recently purchased concentree d'orange verte, and I must say that THAT is certainly longer lasting than most orange-y scents I know. Ah, now CdOV is a great scent, I love it too. I just don't really think of it as primarily orange, although there is some orange. And totally agree on Eau Sauvage! I know I'm a little late with my post but I hope you read this. I have found, for me, the best orange scent i've ever come across. Stella by Tocca, the new EDP. It is fantastic! I know they say it's blood orange but to my nose it smells like the zest and flesh of the most ripe, Florida navel orange. There are some other notes in it as well, floral notes that I usually can't stomach but it just blends so well I hardly notice them. As a Florida girl who grew up on an orange grove I have always searched for a perfume that transported me back there and Stella does it. Happy Hunting and Happy Birthday!!!!!!!!! As I said above, it vaguely recalls Hermes Jardin en Mediterranee, but that one has lots of cedar, so might not be what you're looking for. I do think the Hermes lasts longer, but citrus scents in general don't tend to be long lasting. Welcome, and glad you got your account sorted out! I like the Guerlain Mandarin Basilic better than the L'Occitane myself, and I think it has much better lasting power. I like it because it doesn't smell like “orange” – especially in that “car scent 'natural' spray” kind of thing, with its intrusive rotting orange skins in a dustbin (I guess in the US is trash can). I love the warm combination of citrus, fig leaves and wood, but, yes, it doesn't last. The lotion is excellent in quality but lasts even less than the perfume. I have to thoroughly disagree with Robin’s review. Ruban D’Orange is, in fact, unique because of its longevity and excellent wear as well as the persistence of its soft character. I could say much more in favor of Ruban D’Orange but it is a discontinued item at L’Occitaine so there is little point. I will just say, it was one of my favorites.